Links in Maroon Text jump within this page or to a different page. Links with jump to our A-to-Z Mandala Glossary page. Sources. This page relies heavily on numerous sources, but especially on the JAANUS database. This is a work in progress. Any mistakes or omissions are my responsibility entirely. Please contact me when you find them. OVERVIEW. The Sino-Japanese spelling of mandala (曼荼羅, 曼拏羅, 曼陀羅) is a transliteration from Sanskrit. It holds no inner meaning. It merely represents the sound of the original Sanskrit term, which is sometimes translated as circle, essence, or hitch (as when connecting an ox to a cart). This guide and glossary is about Japanese mandala. It does not cover the origins of the mandala in India nor its rise to great prominence among the Esoteric (Tantric) sects of Tibet and China from the 6th century onward. Two Japanese holy men introduced mandala artwork to Japan in the early 9th century. The two, Saichō 最澄 (Saicho, 766-822) and Kūkai 空海 (Kukai; 774-835), returned to Japan at slightly different times from study missions in China, laden with Buddhist texts, relics, and artwork. Both went on to found (respectively) Japan’s Tendai 天台 and Shingon 真言 sects of Esoteric Buddhism (Jp. = Mikkyō 密教). The subsequent history of these two sects is intimately connected to the mandala, an artform that grew profusely in the rich soil of Tendai and Shingon beliefs and even today continues to underpin and animate the iconography and philosophies of Japan’s Esoteric (Tantric, Vajrayana) traditions. Both sects were likewise instrumental in introducing multi-headed and multi-armed Tantric deities to the Japanese pantheon of gods and in fueling the growth of indigenous Japanese art. Note: Extended descriptions of each entry in Mandala A-to-Z Glossary. Besson Mandala 別尊曼荼羅. Mandala devoted to a single deity. Abundant in Japan. Betsubu Mandala 別部曼荼羅 or Bue Mandala 部会曼荼羅. Mandala devoted to a specific family of deities. Quite rare in Japan. Tobu Mandala 都部曼荼羅 or Toe Mandala 都会曼荼羅. Mandala depicting myriad deities from numerous deity families. Abundant in Japan. The most widely known Toe-type mandala is the Ryōkai Mandala. For more on family divisions, see below. Shishu Mandala 四種曼荼羅 or Daimandala 大曼荼羅. Deities depicted in human form. KONGŌKAI DEITIES. Diamond World, Adamatine Realm. In the standard Kue (Ku-e) Version of the Kongōkai Mandala , the 37 Deities of the Adamatine Realm (Kongōkai Sanjūshichison 金剛界三十七尊) are centered around Dainichi Nyorai 大日如来 and composed of the Five Tathagata of Wisdom (Gochi Nyorai 五智如来), 16 Great Bodhisattvas (Jūroku Daibosatsu 十六大菩薩), Four Paramita Bodhisattva (Shiharamitsu Bosatsu 四波羅蜜菩薩), Eight Offering Bodhisattva (Hachikuyō Bosatsu 八供養菩薩), and Four Guardian Bodhisattva (Shishō Bosatsu 四摂菩薩). See the Mandala A-to-Z Deities Dictionary for more details. Hundreds of other deities and symbolic objects appear as well, but these 37 are the central divinities. They are classified into five families (see below list). SHIIN-E. In center is Dainichi Nyorai (大日如来), surrounded by Kongōsatta 金剛薩埵 (East; Skt. = Vajrasattva), Kongōhō 金剛法 (West; Skt. = Vajradharma), Kongōhō 金剛宝 (South; Skt. = Vajraratna), and Kongōgyō 金剛業 (North; Skt. = Vadrakarma), and eight symbolic objects for total of 13. RISHU-E. In the center is Kongōsatta Bodhisattva 金剛薩埵 (Skt. = Vajrasattva), surrounded by the Four Bodhisattva of the Four Directions: Kongōyoku 金剛欲 (East; Skt = Vajramanodbhava), Kongōai 金剛愛 (West; Skt. = Vajranismara), Kongōsoku 金剛触 (South; Skt. = Vajrakelikila), and Kongōman 金剛慢 (North; Skt. = Vajragarva). These four are shown together with their female consorts, who represent the four intermediate directions. A total of nine deities are typically (but not always) shown. Variations show up to 17 deities. It is hard to see the layout clearly in above diagram. At right is a larger cutout. The numbers correspond to the Five Tathagata of Wisdom. Katsumabu 羯磨部, Action Realm, Skt. = Karma-kula. NOTE: The Nyorai (Tathagata) family is positioned in the center, with the other four placed around it in four compass quarters, creating perfect symmetry both horizontally and vertically. This format has gained great popularity in Japan. Before reaching Japan’s shores, the mandala traditions of India, China, and Tibet followed a three-family format for classifying and arranging the myriad deities – the Buddha, Lotus, and Vajra families. Around the 8th century, however, the three were replaced by a five-family format -- Tathagata, Vajra, Jewel (Gem), Lotus and Action (Karma) families. The Kue (Ku-e) Version (lit. “Nine-Panel Mandala” 九会曼荼羅) is the most widely used form of the Kongōkai Mandala in Japan. It is composed of nine panels, hence its name. 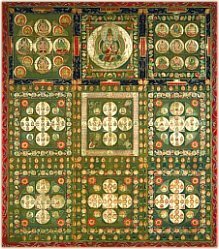 Each panel is a mini-mandala with its own distinct iconography, significance, and textual (sutra) basis. NOTE: The number of deities in each panel and their arrangment can vary, but the nine-panel format is standard. Jōjin-e / Jōjin-ne 成身会. Central mandala of the nine-panel Kue (Ku-e) Version , with Dainichi Nyorai in middle with hands in Chiken-in Mudra 智拳印 (Wisdom Fist Mudra) surrounded by four other Buddha (or Tathagata), each representing a distinct type of wisdom. These are the Five Wisdom Buddha of the Esoteric sects. Sanmaya-e 三昧耶会. Also read Samaya-e. Second panel, below the central Jōjin-e mandala, with the deities represented by symbolic objects (Sanmayagō 三昧耶形). The Sanmaya-e corresponds to the Kongōhimitsu Mandala (Adamantine Secret Mandara). Up to 73 objects appear in this section. Misai-e 微細会. Mandala of Imperceptibility. Bottom row, far left. Typically shows the main 37 deities of the Diamond realm along with many others. Kuyō-e 供養会. Mandala of Offering. Middle row, far left. Shows up to 73 deities, each typically seated atop a lotus and holding a symbolic object. Shiin-e/Shiin-ne 四印会. Top row, far left. Dainichi Nyorai in middle with hands in Chiken-in Mudra 智拳印 (Wisdom Fist Mudra), surrounded by four Vajra Bodhisattva and eight symbolic objects for total of 13. Ichiin-e/Ichiin-ne 一印会. Top row, middle. Panel devoted solely to Dainichi Nyorai, shown with hands in Chiken-in Mudra 智拳印 (Wisdom Fist Mudra). Rishu-e 理趣会. Top row, far right. Nine deities are typically (but not always) shown. Variations show up to 17 deities. Kongōsatta Bodhisattva 金剛薩埵 (Skt. = Vajrasattva) sits in the center, surrounded by the Four Bodhisattva of the Four Directions: Kongōyoku 金剛欲 (East; Skt = Vajramanodbhava), Kongōai 金剛愛 (West; Skt. = Vajranismara), Kongōsoku 金剛触 (South; Skt. = Vajrakelikila), and Kongōman 金剛慢 (North; Skt. = Vajragarva). These four are shown surrounded by their female consorts, who represent the four intermediate directions. Gōzanze-e 降三世会. Middle row, far right. Mandala of the Vanquisher of Three Worlds. Dainichi Nyorai with hands in Chiken-in Mudra 智拳印 (Wisdom Fist Mudra), along with 16 Great Bodhisattva with their hands forming the Gōzanze-in Mudra of Subjegation 降三世印; some 77 deities appear in this panel. Gōzanze Sanmaya-e 降三世三昧耶会. Bottom row, far right. The 37 deities of the Diamond realm, together with 40 others, are represented with symbolic objects. TAIZŌKAI DEITIES. The Womb World, Matrix Realm). 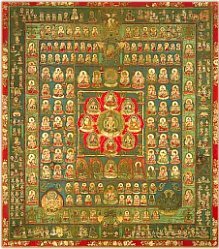 In the popular Genzu Version of the Taizōkai Mandala , some 414 deities are arranged in various deity families and grouped in 12 (twelve) sections or courts. Note: Each below-listed mandala has in Mandala A-to-Z Glossary. The deities appear in 12 (twelve) sections or courts, starting from the center and expanding outward. See above diagram of 12 courts. Chūdai Hachiyō-in 中台八葉院 (Eight Petal Court). Among the deities here, Monju appears holding a sutra in right hand and a lotus surmounted with a five-pronged vajra in left hand.Miroku appears holding a lotus surmounted with a vase in right hand and displaying the mudra for bestowing fearlessness (semui-in 施無畏印) in left hand. Jimyō-in 持明院. Central figure is often the six-armed Hannya Bosatsu clad in armour. Fudō Myō-ō may also appear here. This section also known as the Godai-in 五大院. Rengebu-in 蓮華部院 (Lotus Court); also known as the Kannon-in 観音院. Most esoteric forms of Kannon appear here; Seishi Bosatsu also appears; the six-armed Nyoirin Kannon sometimes appears colored in gold. Shaka-in 釈迦院 (Court of Shaka Nyorai, the Historical Buddha). The Eight Butchō (see Daibutchō Mandala ) appear here, as does Kokūzō Bosatsu, who is shown to right of Shaka holding a fly whisk in right hand and a green gem atop a lotus in left. Monju-in 文殊院 (Court of Monju Bosatsu). Monju typically shown holding a lotus surmounted with a three-pronged vajra in left hand. Fugen appears next to Monju; Gakkō appears here too, as do others. Jogaishō-in 除蓋障院. Nikkō appears here, as do others. Gekongōbu-in 外金剛部院. Outer Section. Often populated by the Twelve Heavenly Deities (Jūniten 十二天), the deities of the 28 lunar mansions and other celestial (or star) divinities, including the deities of the Zodiac’s twelve houses, sometimes the Big Dipper’s seven stars, by the nine planets, etc. See Mandala Deities Dictionary. Konpon Mandala 根本曼荼羅. Literally "Root Mandala." The name given to the first images of the two mandala (Ryōkai Mandala ) brought back from China to Japan by Priest Kūkai (774 - 835 AD). The Shingon mandala lineage based on these "root" mandala is known as the "Genzu" or "original image" mandala. See Genzu Version. Sanjūshichisonyō (Sanjushichisonyo) 三十七尊様. Depicts the deities of the Kongōkai Mandala. It was first introduced from China to Japan in 805 by Saichō 最澄 (766-822), the founder of Japan's Tendai 天台 sect, who also introduced the Daibutchō Mandala, a variety of Besson Mandala. Despite Saichō’s contribution, the flowering of mandala artwork in Japan is credited primarily to Kūkai and the Shingon sect. Mandara Zuten 曼荼羅図典 (Japanese Ed.). The Mandala Dictionary. 422 pages. First published in 1993. Publisher Daihorinkaku 大法輪閣. ISBN-10: 480461102-9. Available at Amazon. Dictionary of Chinese Buddhist Terms With Sanskrit & English Equivalents. Plus Sanskrit-Pali Index. By William Edward Soothill & Lewis Hodous. Hardcover, 530 pages. Published by Munshirm Manoharlal. Reprinted March 31, 2005. ISBN 8121511453.